Franklin added that this was the original cause of the American Revolution – and not the tax on tea nor the Stamp Act, as it has been taught again and again in history books. The financiers always manage to have removed from school books all that can throw light on their own schemes, and damage the glow that protects their power. There is only one cure for America’s ultimate financial collapse and that is for Congress to exercise Clause 30 of the “Federal” Reserve Act, buy the outstanding shares of stock, shut down this unconstitutional system and sell off their assets to reimburse the people of this nation for this unspeakable theft of their wealth. This is the first installment of postings on this issue, new ones will be put up as soon as manpower allows. BINDERUP, Charles Gustav, a Representative from Nebraska; born in Horsens, Denmark, March 5, 1873; when six months old immigrated to the United States with his parents, who settled on a farm near Hastings, Adams County, Nebr. ; attended the county schools and Grand Island (Nebr.) Business College; engaged in agricultural pursuits near Hastings and Minden, Nebr., and also in the mercantile and creamery business at Minden, Nebr. ; elected as a Democrat to the Seventy-fourth and Seventy-fifth Congresses (January 3, 1935-January 3, 1939); was an unsuccessful candidate for reelection in 1938 to the Seventy-sixth Congress and for election as an Independent in 1940 to the Seventy-seventh Congress; organized and was active in the Constitutional Money League of America in Minden, Nebr., until his death; died in Minden, Nebr., August 19, 1950; interment in Minden Cemetery. Please find attached a copy of a transcript of a radio address given by Congressman Charles G. Binderup in 1941. He quotes several times from Benjamin Franklin and Peter Cooper, without giving citations. When I posted this article on my blogsite, several people asked for citations. I would like to know whether the Franklin quotes are genuine, and if so, what are the sources. As far as the exactness of the Franklin quotes the person you should consult (the expert) is Professor J. A. Leo Lemay [lemay@english.udel.edu ] English Dept., University of Delaware, Newark, DE 19716. He is writing the definitive “Life of Franklin” –see his first 2 volumes. Otherwise, to my ear the quotes seem in the spirit of Franklin but sound a bit paraphrased, even anachronistic (e.g. the reference to bankers seems out of place)…especially the latter quotes in the speech. But I could be wrong. I am not all knowledgeable about every word Franklin spoke. The best would be to check through the indexes of the standard sources on the writings of Franklin during the periods mentioned for the phrases…e.g. see THE PAPERS OF BENJAMIN FRANKLIN v. 1-38; or given that the senator was speaking in 1941, one of the older compilations of Franklin’s writings such as A. H. Smyth (1907) THE WRITINGS OF BENJAMIN FRANKLIN v. 1-10. Use the indexes of these to check for key phrases. Finally, setting the accuracy of the Franklin quotes aside, the passages in the senator’s speech are choked full of exaggerated and outright erroneous history. For example, the Currency Acts if 1751 and 1764 did not [REPEAT–DID NOT] prohibit the colonies from issuing paper money. Read the acts, and then look at what the colonies actually did. That these currency acts were the KEY spark to the revolution is highly doubtful. I apologize for not reading what you sent before. I had just replied to a couple Nazi propaganda efforts that resurrect commonly, and I assumed you were asking about them. There are, however, a number of strange statements in the quotation, though it reflects some of Franklin’s opinions. Of course the American colonies were generally regarded as partly New England, partly Middle Colonies, and partly Southern colonies. All had poor houses. Philadelphia had a fairly large one. Franklin disapproved of offering charity rather than work to healthy6 people, but he was also a chief founder and first President of the Pennsylvania Hospital (the first in America), which, like almost all hospitals in the eighteenth century, was a charity hospital. the Indians) and true in the South because of available land and the slave system. Indeed, Franklin said that the Indians in America lived better than the Irish in Ireland — because the latter were oppressed by the English landlords. As for the causes of the American Revolution, the colonists had many complaints, but the most fundamental one was taxation without representation. There are no accurate quotations from Franklin, though sometimes his point of view is reflected in the speech, but sometimes, too, it misrepresents him. I also put the words, “scrip”, “prosperous”, “poverty”, and “English bankers” in the search box on an online version of The Papers of Benjamin Franklin, and found nothing corresponding to the purported Franklin quotes in Binderup’s address. That on a frivolous complaint of a few Virginia Merchants, nine Colonies were restrained from making paper money, though become absolutely necessary to their internal commerce, from the constant remittance of their gold and silver to Britain. — But not only the interest of a particular body of Merchants, the interest of any small body of British Tradesmen or Artificers, has been found, they say, to out-weigh that of all the King’s subjects in the Colonies. Thus, taking away from the colonists the right to issue their own money was indeed a grievance, but it was one of many and does not appear in the Declaration of Independence. what he required.) But Parliament did not object to Pennsylvania’s issuing paper money — only to those colonies who issued nearly worthless paper money. I suspect that had Franklin been in charge of the entire paper currency (as he was, to some degree, in part of 1775 and 1776), he would not have allowed the individual colonies to issue nearly worthless mediums of exchange. On the other hand, Parliament behaved unreasonably to America in the Stamp Act and following years, and Franklin was a better propagandist than Parliament. These reasons for the Revolutionary War, are interesting. If I understand correctly what your saying it makes an argument to have a floating currency. That seems to be what the 13 New England colonies had made for themselves. When the british bankers heard of this colonial script and forced the use of coin, it caused a tightening of the money supply and a reversal in the colonies economic fortunes, like England was experiencing. I realize if you print more money than the core inflation of say 2.5% you run the risk of tainting the faith of the people that your currency is is sound. What do you think? That was amazing. See keyword “money masters” as well. The trend seems to be toward total control of the masses. For this reason, I believe Guliani or Hilary will be elected. Neither of these choices are good from America. I think that this is quite a stretch. i guess the logic is there, but the truth of the matter is that the relation between the colonies and England was volatile. England saw the colonies as incapable and undeserving after the 7 years war, and then that’s when they started shipping over soldiers, introducing taxes (all for control over the colonies to gather the MOST economic growth). It’s a very interesting point though. Maybe it would be better to say that Franklin incited feelings that pushed in the general direction of the Revolutionary war. This way of thinking is exactly what the country needs to become what it stands for again. The clear thinking of these great minds makes as perfect sense now as it did then. WHO CREATES THE MONEY TO PAY THE INTEREST? One of the most perplexing questions associated with this process is “Where does the money come from to pay the interest?” If you borrow $10,000 from a bank at 9%, you owe $10,900. But the bank only manufactures $10,000 for the loan. It would seem, therefore, that there is no way that you – and all others with similar loans – can possibly pay off your indebtedness. The amount of money put into circulation just isn’t enough to cover the total debt, including interest. This has led some to the conclusion that it is necessary for you to borrow the $900 for the interest, and that, in turn, leads to still more interest. The assumption is that, the more we borrow, the more we have to borrow, and that debt based on fiat money is a never-ending spiral leading inexorably to more and more debt. This is a partial truth. It is true that there is not enough money created to include the interest, but it is a fallacy that the only way to pay it back is to borrow still more. The assumption fails to take into account the exchange value of labor. Let us assume that you pay back your $10,000 loan at the rate of approximately $900 per month and that about $80 of that represents interest. You realize you are hard pressed to make your payments so you decide to take on a part-time job. The bank, on the other hand, is now making $80 profit each month on your loan. Since this amount is classified as “interest,” it is not extinguished as is the larger portion which is a return of the loan itself. So this remains as spendable money in the account of the bank. The decision then is made to have the bank’s floors waxed once a week. You respond to the ad in the paper and are hired at $80 per month to do the job. The result is that you earn the money to pay the interest on your loan, and – this is the point -the money you receive is the same money that you previously had paid. As long as you perform labor for the bank each month, the same dollars go into the bank as interest, then out the revolving door as your wages, and then back into the bank as loan repayment. It is not necessary that you work directly for the bank. No matter where you earn the money, its origin was a bank, and its ultimate destination is a bank. The loop through which it travels can be large or small, but the fact remains all interest is paid eventually by human effort. And the significance of that fact is even more startling than the assumption that not enough money is created to pay back the interest. It is that the total of this human effort ultimately is for the benefit of those who create fiat money. It is a form of modern serfdom in which the great mass of society works as indentured servants to a ruling class of financial nobility. Anyone who wants to ‘know’ should really check out G edward griffin’s book: the Creature from Jekyll Island. And, honestly, you people should really read it twice. The England banking system was controlled by Jewish interests – the Rothschilds – just like the Federal Reserve is a private banking system controlled by a private banks owned by Zionist/Jewish interests. Ben Franklin was suggesting we do the exact opposite of what Ron Paul wants(return to the gold standard). You read other writings from Franklin and he saw great value in increasing the money supply to fuel new investment. I feel sorry for the people who read this and take it as literal truth. It’s clear you’ve got a conspiracy theorist bent on this blog. The posting isn’t without its merits, but it’s so obviously one sided and incredulous as to be laughable. Everyone should take Econ 101-102 at the very least and understand money / banking / monetary supply before jumping to wild conclusions after reading this kind of rhetoric. you don’t think your economics books aren’t windblown with rhetoric. you even calling hims bias a ‘conspiracy bent’ is a rhetorical device of some narrative you’re not questioning. these certainly are not wild conclusions. one ought not use textbooks or any secondary text when obtaining knowledge. if we go to Franklin himself, which perhaps the author did, we can see that he favored paper money, and like many other Foundin’ Fathers disliked the paper money system of the bank of England. You can check out Madison’s notes on the Constitution if you like, or Jefferson’s papers, both of which have instances of restructuring the new nation’s economy and way to finance. The Constitution actually gives Congress the right. But that is continually ignored by congessmen, who are in the pockets of the Money Power, as v. Buren called it. But besides this, I would be willing to say that trusting professors aren’t even safe sources. they’re as complacent as any other person, perhaps a bit more stuffy and pedantic. Again, i say learn the words yrself, and the conetxt of the time. Jackson got rid of the bank, paid off our debt. Every war is fought over currency, the fact of it is just not publicized by the well financed and armed bankers and their cohort. Victors write the history books and truth is far removed. The only thing more corrupting than money is power and without one you cannot have the other. Stop disbelieving conspiracy exist, it does exist or we would not have RICO laws. Just finding evidence is hard since cleaning up the crime is the signature of a successful bandit. Rothchild certainly was aware of this and his entire family has made it to the top doing it. Quote: It’s clear you’ve got a conspiracy theorist bent on this blog. Well spotted, anon @ October 22nd, 2007 at 10:17 pm. This is an interesting comment. Yes, perhaps in a way it is correct to say that. However, you could also say that both Franklin and Paul agree that control of the monetary system by the central banks is bad and should be avoided. If you would call Ben Franklin a conspiracy theorist–someone who actually lived in that time and understood the politics of the time intimately–then I think Ron Paul and the people on this blog are in good company. Wow well written article. It would be interesting to see some citations and links to the quotes referenced tho. I and I imagine others have had issues just taking in things without solid proof. This is all very plausible and I believe it, but seeing links to the material would be nice. Some of it I know offhand but I think alot of people would benefit if the material was referenced. ..sounds like controlling the money supply to me. If you want to know the history of the economic boom bust cycles before the implementation of the federal reserve go back and read about it. It was boom/bust every ten years… and when I say bust I mean all the banks failed and people lost everything. his conclusion is horse hockey. there is benefit to liquid transactions in that they reduce friction that slows commerce, but making instruments paper or coins or linden dollars makes little difference. they’re just symbolic. the wealth of a nation is simply the sum of the productive output of it’s members, which is equal to generally the total income of it’s members. it’s almost entirely a closed circle of production and consumption (see Keynes) and whether you measure that in money or in widgets produced the wealth has little to do with the measurement made or instrument used for transactions. To increase wealth, one merely improves productivity and output in the circle, simply put. Make the pie bigger basically. Others have already said it well, but it bears repeating: What Franklin attributed to the success of the colonies is the antithesis of what Dr. Paul would like to do. In real sense of irony, the effect eliminating the current Federal Reserve system would have the effect the same or worse effect as what happened to the colonists. For the record, I admire Dr Paul. I believe in his principles, but some of his economic policy simply won’t work in a modern, globalism, 21st century economy. The US *has* to have a central banking system. The issue is not that the money supply is controlled, but that it be well controlled. Mr Franklin did not say the colonies had uncontrolled money. If you read the report carefully you will see that he said the money supply was regulated. Mr Binderup was a child of the depression. This was a time when world monetary policy was misguided. A recession hit and the federal reserve totally messed up and contracted the money supply. The whole world did the same. The result was a global depression lasting into WWII, right at the time this article was first published. The staggering failure to correctly control – was it due to evil or ignorance? I think ignorance much more than evil. The economic theory explaining the depression was presented and accepted by economists following WWII. Had the fed understood the results of their actions, they would have acted differently. If you stop regulating the money supply, it will move as it will, sometimes loose, other times tight. The social consequences still occur. They are not due to regulation. They are due to the intrinsic effects of the money supply. It makes sense to argue about how the money supply is controlled – who controls, what are their motives, what is their understanding, what is their skill, can they be influenced by people with selfish private interests. It is foolish to give up control outright. So they decide to put a dam on the river above the town, and regulate the flow so it does not flood and does not run dry. In summary, the FED creates depressions so they can bankrupt society and thereby buy up assets for pennies on the dollar. This is all a matter of easily obtainable verification. Just look at the timing of their retractions and the depressions it caused in the 1930s. Then see how these international cartels pull the same stunts all over the world. In the 90s the FED flooded the system with easy money; then with the TARP rules and the rules of Basal II, the money supply has once again been retracting by the national banks. Don’t you get it yet?! The only way I could see this to be in the bankers interest is by causing deflation. Restricting the money supply causes deflation which causes assets to be worth less, benefiting the people (bankers) who hold the paper (givers of loans). Destruction of capital wealth, restricts the growth of new wealth, causing stagnation. From what I’ve read, the Colonies did go through a sort of trial and error period with paper money and the resulting inflation of the money supply because of the Revolutionary war. After the war inflation grew to 5000% in one year with the Colonial Scrip. George Washington once commented that “A wagon load of money will scarcely purchase a wagon of provisions.” Our forefathers knew and understood very well the dangers of paper money and of Central Banking and the corruption that it could lead to. Thomas Jefferson was very much against it. I agree with the article about the cause of the Revolution but disagree that paper money needs no backing. With no backing like gold or silver the temptation to print money out of thin air is too great and will always ultimately lead to corruption like our Federal Reserve Cabal. When we talk about historical “gold money or gold backed currency”, in general, these systems and related banking systems were not true gold money systems because the government in charge regulated or fixed the price of the gold (or silver in the bi-metal systems); or fixed the reserve ratio (how much gold per outstanding paper currency) for issue of backed money; or fixed the banking reserve ratio (how much money of whatever chacter is to be held in reserve) for the issue of credit money. In a true gold money system, the value of the money might rise or fall based on negotiated exchange transactions. One ounce of gold today might buy two hundred gallons of gasoline; tomorrow, it might buy three hundred gallons, either because demand for gasoline went down or because the marginal utility of the gold money for transaction purposes went up. So what? So it’s not fair to say what Ron Paul advocates compared to the historical systems until you can define with some specificity what he advocates and what the historical system was. The 18th century British gold system was not a true gold money system; I read Congressman Paul as advocating something like a true gold money system. I believe, (with more than just Econ 201 and 202) that a gold money system would work perfectly in our economy. A very good post with many illuminating points. I just want to add that the paper money system controlled by a government is quite obsolete although it was a cutting-edge idea in Ben Franklin’s period. Since the 70’s, it has been quite well known that a government never controls its spending and therefore there would be the contant inflation if the monetary system is taken care of by the goverment. This is why these days most countries try to have an independent central bank, such as Federal Reserve, and a goverment which aims to have a balanced budget. meant to combat monopolys and these laws stringently enforced. This would require a lot more detail to work but it would be much like the North Dakota State bank sytem with some tweaks and still have a common currency across the nation. I’ll add my name to the list of people looking for the reference to sources in this document. It is well written, but I don’t see it on wikisource and would love to add it. A number of people have requested citations for this article. The reason it has none is that it is a transcript of “a radio address given by Congressman Charles G. Binderup of Nebraska, some 50 years ago and was reprinted in Unrobing the Ghosts of Wall Street”. The transcript which appears on a number of websites does not have citations. Binderup cites a couple of authors without naming their works, and quotes Franklin on several occasions without naming the source. The only way I can provide citations, if at all, is by trawling through the entire published works of Benjamin Franklin, which is a task I would willingly undertake if I felt that it would make a difference to the current situation. In the meantime, readers are urged to read some of the other articles on this website on the subject, such as the Wikipedia article, Colonial Scrip, and the article, How Daddy Warbucks and his Pals Screwed the American People, which is about how the Fed was clandestinely foisted upon the American People. One of the authors Binderup cites is Peter Cooper, and the work in questions is probably, Ideas for a Science of Good Government. The Franklin quotations may come from this source, but it is a secondary source. They may also come from, The Autobiography of Benjamin Franklin, Part XXIV, a dead link to which is posted on the Wikipedia article on Colonial Scrip. I will investigate over the weekend and add citations where possible. A STRICTLY NATIONAL PAPER CURRENCY, BASED ON NATIONAL TAXATION, IS THE CHEAPEST, SAFEST AND MOST CONVENIENT MEDIUM OF EXCHANGE FOR A REPUBLIC. APRIL, 1882. It will always be a cause of regret to every right mind, looking back upon the wants of a great people in its deprivation of a currency, which might have been utilized without difficulty in making exchanges, that it was left to the tender mercies of local banks. Jefferson, the author of the Declaration of Independence, raised his voice against the curse of the local banks, which were allowed to come into being by the neglect of the Government in the performance of its duty, and in the payments of its debt in some form or shape. The Government should have given to the country a steady currency it so much needed, and which the people had every reason to hope for and expect ; because all the Provinces had been in the habit, for a number of years, before the Revolution, of issuing what was then known as Colonial Treasury Notes ; these notes were made receivable by the several Provinces for taxes ; and anything the Government would accept for taxes, everybody was glad to take in exchange for every other kind of property. These Colonial notes, being adopted by all the Colonies, led to an unexpected degree of prosperity, so great that, when Franklin was brought before the Parliament of Great Britain and questioned as to the cause of the wonderful prosperity, growing up in the Colonies, he plainly stated, that the cause was the convenience they found in exchanging their various forms of labor one with another by the paper money, which had been adopted ; that this paper money was, not only used in the payment of taxes, but in addition it had been declared legal tender. It rose 2 and 3 per cent. above the par of gold and silver, as everybody preferred its use. One of its advantages was its security against theft, as it could be easily carried and hidden, on account of its having no bulk, as all kinds of specie necessarily must have. After Franklin had explained this to the British Government as the real cause of prosperity, they immediately passed laws, forbidding the payment of taxes in that money. This produced such great inconvenience and misery to the people, that it was the principal cause of the Revolution. A far greater reason for a general uprising, than the Tea and Stamp Act, was the taking away of the paper money. this will really help for a school project. Thank you sincerely for a thought provoking, and interesting article, and ensuing discussion. I hope many more will read and continue the discussion. We have a debt backed money system. For the longest time, I too was sucked into the false belief that we should return to the gold (or silver) standard. The spark for the counterpoint came from Mr Still’s (See Bill Still’s “The Money Masters”) arguments against it. 2) our money is backed by debt. b) institution of a “pull” money system. Right now, not only is our money debt backed, i.e. for every dollar of credit issued, there is a dollar value of a bond, the us government bond, that the taxpayer is burdened with paying interest on, but the increase of the money supply is exponential, and completely out of control of the taxpayers. From 2004 through 2006, our money supply, M3, grew by over %20 a year. You can find this on the Fed’s web sites. Since growth of M3 is the most general method of determining long term inflation, e.g. most economists use (M3_growth – increase_in_gdp) we’re at approximately %20 – %2 = %18 long term inflation. The Federal Reserve has obfuscated the numbers by removing energy and food, the two main places where consumer inflation shows up first. Not only is our money supply increasing drastically out of proportion to the goods and services generated by the US economy, the increases in M3 are directly correlated with debt, and rightly so, that’s where it comes from. If Congress had no mechanism to create debt from money, for example, if they could only create money based on real GDP growth, and each dollar of credit created had no debt associated, then the system would work perfectly, until the criminal bankers got their hands on it again. So, we’d have another 100 years of fantastic prosperity. I also believe Mr Paul is wrong, in arguing for a gold backed monetary system. He’s wrong because the world central banks control most (I’ve seen written estimates of %85) of the world’s investment grade gold supply. He’s wrong because the core problem, the Federal Reserve system, would find a way to manipulate the price of gold, and thus, the value of the dollar. He’s wrong because creation of money would still be backed by debt. Contrary to popular belief, there’s lots of gold in the world. it just gets mined, refined, and hidden away in central bank vaults, where it serves no useful purpose. Many people miss the point of central banks. Most mistakenly believe they are run by the government to benefit the people of the country. In reality these “banks” (which are not actually banks at all since they hold little to no reserves) benefit the government and bankers. The government takes money from the reserve (although there are no reserves so the money is created out of thin air). This money is taken because the government could not cover all of its obligations through taxes (hence yearly deficits and a national debt). The government spends the money which eventually ends up in actual banks. The banks then loan out about 700% of their deposits through fractional reserve banking. So again money is created out of thin air. This of course causes inflation but banks do profit off of this because they collect interest on the money they loaned out. People are screwed over because their money is worth less and less all the time. Bankers benefit because they make a huge return on assets even though the value is lowering. Lets say I deposit $100 in a bank. The bank then loans out $700 to others at 10% interest. That means the bank is making $70 a year off of my $100! A 70% return! When the money supply contracts (which the fed did at the beginning of the Great Depression) smaller banks fail because people come running for their money which is not there. The larger banks gobble up the smaller ones plus all the property, cars, and whatever else loans were taken out for for pennies on the dollar. These large banks make up the central banks of the world. So they benefit in times of inflation and deflation. The biggest bankers in the world wrote the Federal Reserve Act so they could consolidate more money in power. The Fed is a cartel and does not stabilize the currency…look what happened less than 20 years after the fed was created. Everyone should read a book called “The Creature from Jekyll Island: A Secon Look at the Federal Reserve” by G. Edward Griffin for a detailed look at how central banks work and how the fed was created. All Central Banks are modeled after the Bank of England which was first incorporated in 1694. The Bank of England adopted and monopolized the fraudulent practice of fractional reserve lending (counterfeiting) which originated with the early goldsmith/bankers who were accepting deposits of gold and silver coin and issuing engraved paper notes in exchange. These goldsmith/bankers evolved from money changers who were predominantly Jewish. Here is how the scam works. Consumers deposit their metal coins with the banker and receive paper notes which are easier to handle. They can return to the banker and redeem their notes for coin at any time, but they seldom do this because the paper money is more convenient, i.e. easier to handle, store and carry. Once the banker has established confidence among consumers that his engraved notes will be redeemed in coin, he can then increase the notes in circulation simply by printing them and lending them out at interest without accepting coin in exchange. The banker will eventually float ten times more paper money than he has coins in reserve. This makes the banker ten times wealthier than all of his customers combined who have deposited their coins under his trust. This is counterfeiting, but the bankers call it fractional reserve banking where the reserves of coin or precious metal is just a fraction, usually one tenth, of the amount of paper notes in circulation. If all the consumers carrying paper notes converged on the bank all at once to redeem their paper, they would not be able to redeem it for coin as promised. The banker would become “bankrupt” and would usually flee to another country to set up a new scam. So the trick to continuing the counterfeit operation was to maintain consumer confidence. Many bankers would form cartels where they would combine their reserves into one pool in order to weather any bank runs. This is how the Bank of Amsterdam and the Bank of Hamburg were formed, the first two Central Banks in history. When the Bank of England was incorporated afterwards, setting up the King of England and his aristocratic friends as stockholders, the scam became institutionalized for the first time on a national level. In effect, the British blue bloods took the public credit away from public ownership and made it their own private property. This enabled them to create a new, high tech form of serfdom. Instead of issuing the public credit as a credit to the public, the money/credit was mysteriously issued as a debt to the public and taxes had to be raised on everyone in order to pay back the principal with interest. The entire scheme was fraudulent. The resulting issues of fraudulent, counterfeit debt money turned the entire workforce of England into slaves and the stockholders of the Bank of England were enriched by the taxes collected to pay the principal and interest on the fake debt which the bank created out of nothing. In the meantime in America, the colonists had to rely on barter, wampum, tobacco leaves and beaver skins as a medium of exchange because there was very little gold and silver available. But this changed when Ben Franklin, as a young genius, promoted a paper money system, colonial scrip, which was issued by the colonial governments honestly as a credit, not fraudulently as a debt. The credit money was issued directly or spent as a payment for work on public projects or loaned out to private individuals who pledged land as collateral. The colonial government did not have to issue bonds and put the taxpayers into debt to create scrip money. Scrip was issued as a credit, not a debt. The scrip was used to put people to work and the goods and services created by the work is what gave the money its stability and value. Gold and silver wasn’t needed. If there were idle people looking for work, the colonies put them to work building roads and bridges or other public projects and printed the money as needed to compensate them. The public workers would then go into the marketplaces to redeem the money for the goods and services they needed. As long as there are goods and services available in the market, then the paper money could be redeemed and it could afterward circulate as a medium of exchange to simplify trade. Franklin’s Pennsylvania Scrip worked perfectly. No one was idle. Those who wanted to work were put to work. And since the money was issued as a credit for work, there was no debt to pay, taxation was very light and everyone prospered. As long as the scrip was issued in exchange for work it retained its value. But if the scrip were issued without creating work, then the resulting inflation would cause it to lose its value or become worthless. Without the work, no goods or services are created to redeem the money. As a result of Franklin’s ingenius innovation, the American Colonies became the wealthiest region of the earth. As long as the scrip was backed by the marketable goods and services created by work, there was no need to borrow gold and silver to create a reserve. When Franklin went to England and explained to Parliament how the Colonies became so prosperous, the Aristocratic stockholders of the Bank of England felt threatened. 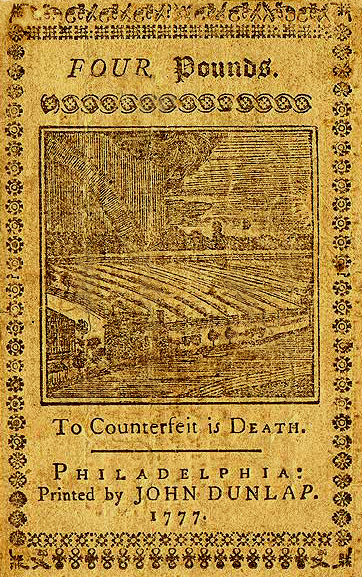 Franklin’s honest paper money was a dangerous threat to their cash cow. So they passed the Currency Act of 1764 to outlaw Colonial Scrip. This threw the Colonies into a severe depression for more than a decade which eventually culminated in the American Revolution. The stamp and tea taxes were just the straws that broke the camels back. Had Franklin’s scrip system been allowed to continue, we would eventually discover that taxation, usury, inflation and recession are economic evils that could be completely eliminated. Taxation, usury, inflation and recession are economic aberrations that arise under a dishonest money system. Our Federal Reserve System is a corrupt system modeled after the Bank of England and controlled by a syndicate of European Bankers headed by the Rothschild Family. (google Rothschild) The New York branch of the Federal Reserve Bank is owned by private bankers who belong to the secretive Rothschild Syndicate. When the U.S. Congress needs money, instead of printing it and spending it for public works projects, they must borrow it from the Federal Reserve Bank of NY. They pay back the principal and interest on the loan, which the bankers create out of nothing, by taxing you an me. Again we have private bankers who have been given total ownership of the public credit. The Federal Reserve Bank of NY is the source and fountain of our U.S. Credit. If we could get our Congress to repeal the Federal Reserve Act and issue money honestly as a credit, we could use them to redeem all Federal Reserve Notes, Bills, Bonds and other forms of U.S. indebtedness and completely wipe out the $11 Trillion Federal debt in one swoop. Why should we borrow our fiat paper money from private bankers and owe them principal and interest when we could just create and spend the credits on public projects to put everyone to work and not create any debt? If we return to our government the power to create honest credit money, they would never have to tax a soul. Anytime they need money they could just create it. But they must use it to put people to work to avoid inflation. They could also lend it to creditworthy citizens free of interest. We would only pay back the principal. Such a lending operation would enable the government to eliminate inflation and recession simply by turning the credit spigot off or on. When inflation begins to appear, slow down the lending. When recession begins to appear, increase the lending. So imagine what the world would be like if we had no taxation, no usury, no inflation and no recession. We would all be more prosperous, more secure and happier. And by eliminating the parasitic bankers from the equation, we would also eliminate the profiteers of the military/industrial complex who create wars and manipulate global events for the sake of profit. The world would be a better place for sure. I did not learn these things in school. My knowledge of money comes from many years of research. Both Abraham Lincoln and John F. Kennedy tried to eliminate the dishonest money system by replacing it with an honest scrip system. They both were assassinated and the facts were covered up. This is how powerful the Global Banking Syndicate of the House of Rothschild has become. During the past two centuries, the Rothschilds have set up their Central Banks all over the world. Like the Wizard of Oz, these bankers are able to rule the world from behind a curtain. I really enjoyed your piece, not only did it clarify, but, just as importantly, it organized and put in perspective, and in historical chronology, my overall understanding of both Franklin’s Credit and the British (Hamburg/Dutch? )Debit Systems, for which I can’t thank you enough. Before I move into my question, per se, I must, first, ask you two preliminary questions. First: As for the Bank of Hamburg, mentioned in your paper, was it not, and correct me if I’m mistaken, founded by Mayer Rothchild, the original patriarch of this family’s dynasty, perhaps, while he was still serving the Royal House of Hamburg in the capacity of the court’s Coin Expert and the King’s personal advisor? Second: Wasn’t Mayer Rothchild, also, the man personally responsible for, and behind the liberation of the Jewish ghettos in Europe? My question, then, concerns the two times the Rothchild Bank brought the Bank of England down to its knees, in order to coerce the King of England to lift the quase-slavery conditions under which Jews lived those days. The first time, England, or better, the King, deviously, reneged on his word. Approximately, ten years later, Mayer does it again! And, through the same astute financial maneuvering, or scheme, with the help of his two sons, Philip and Nathan, who at the time were, respectively, the heads of the Rothchild Bank in Paris and London, Mayer Rothchild brings the mighty British Empire down to its knees – for the second time! I’d like to thank you, in advance, for the courtesy of your time and answer. The city in Germany Mayer Rothchild lived and worked was not Hamburg, but Hannover. Hannover belonged to England. That’s the reason for his closeness to the Bank and King of England. Mayer Amschel Rothschild was training to be a Talmudic Rabbi when his parents suddenly died and he was sent to Hanover to become a young apprentice in the Oppenheim Bank. It was in Hanover that Rothschild learned about the Bank of England’s fractional reserve system. It is also my theory that Rothschild became a member of the Rosicrucian secret order which was open to Jews and persons of all faiths. He returned to Frankfurt A.M. with this knowledge and set up his own bank based on the fraudulent fractional reserve system of the English. In time he became a financial agent a.k.a. Court Factor and advisor to the Elector of Hesse and eventually a Crown Agent to the Austrian Emperor. Through fractional reserve banking he became extremely rich and used his wealth to finance his own Rosicrucian style secret society, the Illuminati. Rothschild was keen to how the Rosicrucians, under the leadership of Sir Francis Bacon, had established lodges of Freemasonry for use as revolutionary spies and foot soldiers, organized to challenge the mind control and tyranny of the Catholic Powers. Bacon’s Rosicrucian headquarters in London remained invisible. His staff of literary masters created the King James Bible and Shakespeare’s plays as a means of perfecting the English language. It was a perfect set up for revolutionary action. The Freemasons took their orders from invisible Rosicrucian superiors. Bacon’s army of Freemasons were ritualized into following orders from unknown superiors without questioning who, why or how. This created a serious problem for the Catholic powers. How do you defeat an invisible enemy? Bacon was an occult genius who I find very fascinating. The object of his secret society was to transform the World into a Utopia such as the one he wrote about in “New Atlantis.” Although more than a century had passed, Rothschild apparently figured out Bacon’s scheme and duplicated it by setting up and financing the Illuminati in Frankfurt. And that is how a Jewish moneychanger in the Frankfurt ghetto, without civil rights, ironically became the invisible master of the Illuminati. Weishaupt was his visible front man. By getting the existing Masonic lodges to graft Rothschild’s Illuminati degrees on top of their existing degrees during the Wilhelmsbad Convention in 1782, Rothschild was able to assume control over French Freemasonry a.k.a. the Grand Orient headed by the Duke of Orleans. And thus the little Jew man in the ghetto had his own army of spies and foot soldiers who were able to spark the French Revolution. During the Great Revolution, Rothschild made sure the Jews were freed from the ghettos and given civil rights. Rothschild’s most talented son, Nathan, was sent to England with lots of money where he eventually became a trusted financier to the British government. The youngest son, Jacob a.k.a. James, was sent to Paris to assist. With insider knowledge Nathan was able to engineer a panic on the London exchange by spreading rumors that Wellington’s army had been defeated by Napoleon at Waterloo. This caused thousands of investors to dump their British Consols. When the price of Consols hit rock bottom, Rothschild’s agents bought them all up for a song. The next day the real news came that Napoleon had been defeated at Waterloo. This caused all of those British Consols to return to par. Rothschild was now extremely rich in paper, but he knew that the Bank of England did not have enough gold in reserve to redeem all that paper. Instead of forcing the Bank of England into bankruptcy, Rothschild cleverly set his private bank up as the lender of last resort to the lender of last resort. By this covert method, Rothschild became the de facto Bank of England while remaining invisible to the public. Afterwards, Nathan and his four brothers established banking houses in the major capitols of Europe creating the first international clearing house. Thus the Rothschild’s became Bankers to the Kings of Europe and invisible masters of the New World Order. Bacon’s original goal of using Freemasonry to create a Christian, New Atlantis in America has been twisted by the Rothschlds into creating a Zionist, New Jerusalem in Israel. That is why America is now being sacrificed on the altar of Israel. And now you have the whole story. if you are going to say how Ben Franklin made nNew England prosperous, then say how. How did the banking system operate? The economic damage that results due to borrowing our currency into circulation from a PRIVATE BANK is dramatic, but the most disastrous effect is the usurpation and loss of the Constitutional Law system (Common Law) by the Commercial Law system (Law Merchant or Contract Law). It’s called “CHOICE OF LAW” meaning you choose (or acquiesce to) the legal system and the jurisdiction according to the monetary device utilized or the contract agreed upon to conduct business. The Constitutional Law system rests upon the monetary standard stated within it. That standard demands usage of gold and silver coin that are derived from the earth (land) and support the Law of the Land ie., the Constitution. Commercial Law creates its own authority and jurisdiction under the law of contracts which is Private Law. All governments across the United States accept commercial paper in violation of the Constitution to complete all transactions. These governments are operating UNCONSTITUTIONALLY. Today, people complain that they have no Constitutional Rights for good reason, They don’t. Politicians talk about the Constitution but continually violate it and their oath to uphold and support it because the vast majority of people in America have forfeited their Constitutional condition and Rights for the Socialist System (Social Security) that offers mere privileges subject to government administration. This is a tough pill for most to swallow because they have a firm grip on the illusion they’ve been brainwashed to accept from birth. I think everyone has missed the constitutional power a sovereign govt. has to raise credit and therefore charge only nominal interest-if any in order to institute all the necessary infrastructure required of good governance as well as loaning to worthy enterprises, eg. Low interest loans to farmers. Let’s not forget usury is prohibited by the good book and let’s examine Franklin very closely as apparently he was an illuminatist of the higher Freemason category (perhaps turned-asaresult of all these visits to London & hellfire clubs,etc) which would align him with the slave-making theology of fractional reserve banking! does anyone know the location of this comment? I’m surprised that a number of related issues aren’t referenced here. Many people have written on this topic since the days of Ben Franklin. Here are just a few. Control Fraud: The Looting of Corporations by a Few. What is a Government Sovereign in Its Own Currency? I don’t necessarily buy the idea that Parliament had to prohibit paper currency because it was worthless in those nine colonies. Worthless currencies tend to destroy themselves because no one will accept them as payment for goods. Only valuable currencies need be suppressed if they compete with the currency preferred by those running the show. And why would Parliament prohibit internal use of paper money among those colonies? The most obvious reason is that the English investors in the colonies desired to keep the colonies in debt, and to keep dividends rolling back into England. If the colonists could use paper money internally, then they could use gold and silver (scarce in the colonies) to pay off debts. With the reduced money in circulation following the Currency Acts, not only would the colonies be unable to pay off debt, but unemployment would increase and wages would drop – all boosts to dividends. Not to mention the depressing effect a drop in colonial wages would have on domestic wages. Win-win for the financiers.